Club World Casino is US friendly casino that offers Samsung slots to play on your Android device. This casino was launched in 2005 and is one of the most experienced, legit and trusted brands in the online Casino industry and is part of the Corrales group of online casinos that utilize Real Time Gaming software, giving you the ultimate online casino experience with more than 150 authentic Casino games, which can be played for free or with real money. Club World Casinos has won a wide range of awards over the past 11 years and awarded the Casino Meister award as the best casino group, best US casino of 2014 and Wizard of Odds Approved since 2016. The casino more than 150 games as said above offering slots which are over 120 in number, table games, video poker, progressive jackpot games, speciality games and much more. You can enjoy new slot games like Fucanglong, Sweet 16, Snowmania, Witch’s Brew, progressives like Aztec’s Millions, Cleopatra’s Gold and many others. Among the table games you can find Baccarat, Blackjack variations, Pai Gow, Pontoon, Texas Holde’m, Casino war and many other of such kind. Poker games include Aces and Eight, All American, Deuces Wild, Bonus Poker, Jacks or Better to name a few. In speciality games you can enjoy Roulette, Dice Games; Bingo , Craps, Sic Bo and other such games. The table and slot games are developed and licensed by Real Time Gaming (RTG) whose software is amongst the very best, utilizing the latest technology available. All these games can be enjoyed either by casino download , instant play version which can be played on your PC even on Mac device or with your cell phone and tablet devices be it iOS, Windows or Androids. 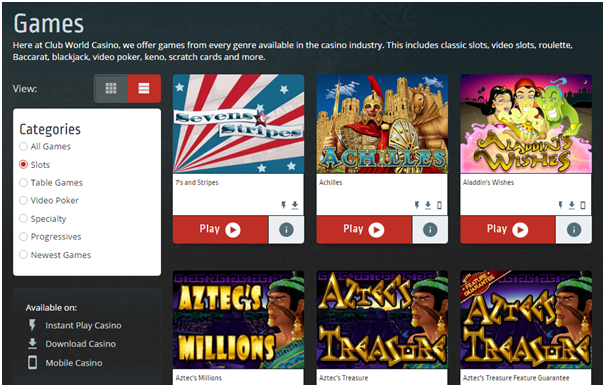 To enjoy the above mentioned games you need to first create your account by registering yourself at the online casino. 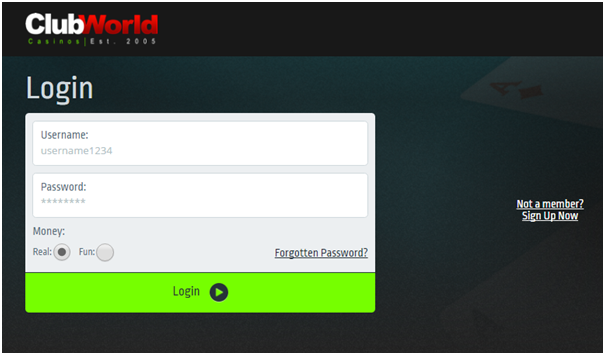 You need a user name and a password to login and choose whether you wish to play for real money or for fun. Once you decide to play for real money you can then grab the welcome bonus at the casino which will be availed to you with a minimum deposit of $35 (at the time of writing). To play for free or real money at Club World Casinos you will need an internet connection and can either download and install casino software on your computer or access the casino via instant play in your web browser or on your cell phone device. You need to be 21 plus of age to play these games. When you sign up with the casino and open your casino account you will at once be able to redeem awesome casino welcome bonuses. The unique thing about this casino is that it offers not one but two welcome bonuses. Coupon BIGSLOT, the deposit and bonus must be wagered 30 times on Slots, Keno and Scratch Cards before a cash out is permitted. You can only redeem BIGSLOT on the first deposit. The casino also offers various other bonuses like daily and weekend bonuses plus other prizes and rewards that you need to keep an eye on here. 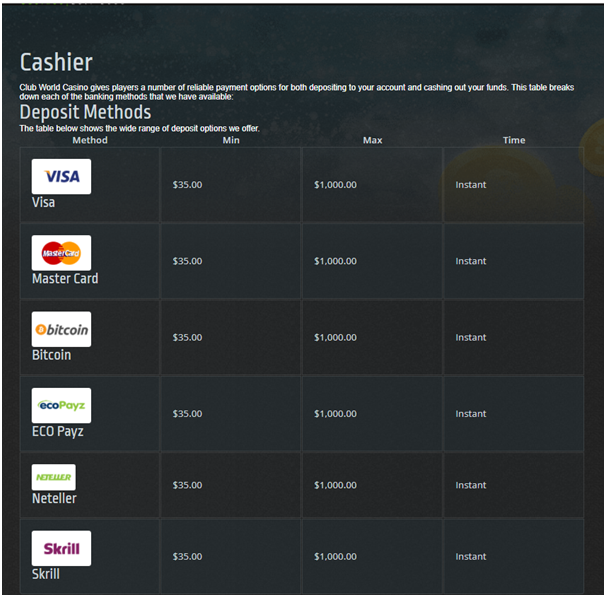 The casino offers various deposits modes for the players to fund the casino account like VISA, Neteller, Skrill, Bitcoin, MasterCard, Ecopayz and more. 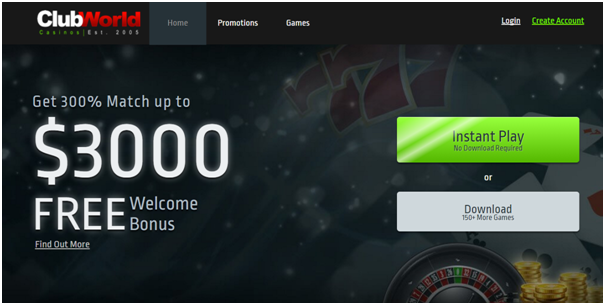 You have minimum deposit of $35 and go up to max $1000 in instant play version. For withdrawals you can use bank transfer, wire transfer, check, VISA, Bitcoins, Neteller, Skrill, Mastercard and few others. You can visit the cashier section to know more about in detail. Kindly note that all your online transactions are safe and secure as the casino is SSL encrypted and uses RTG fair gambling software. The casino offers 24/7 customer support which can be accessed either by Live online chat, email through a web form, toll free number 1-888-671-2855. You can also visit their FAQ section in case you wish to know answers to your general queries. ← How to get your Samsung Galaxy S8 going fast all the time to play slots?